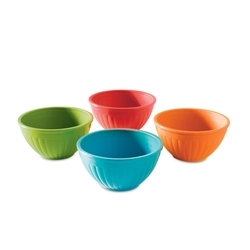 4-Piece Mini Prep & Serve Bowl Set Our new prep and serve bowls are not only perfect for organizing ingredients while baking, but they are just the right size for serving small portions. Microwave safe. Product Features: BPA-free and Melamine Free Plastic Interior Dimensions: 1 cup capacity Exterior Dimensions: 4.13"L x 4.15"W x 2.38"H Product Weight: 0lbs Made in the USA Care and Use: 1. Before initial use and after subsequent uses, hand wash with warm, soapy water. 2. Top-rack dishwasher safe. 3. For microwave and storage use only. Our new prep and serve bowls are not only perfect for organizing ingredients while baking, but they are just the right size for serving small portions. Microwave safe.